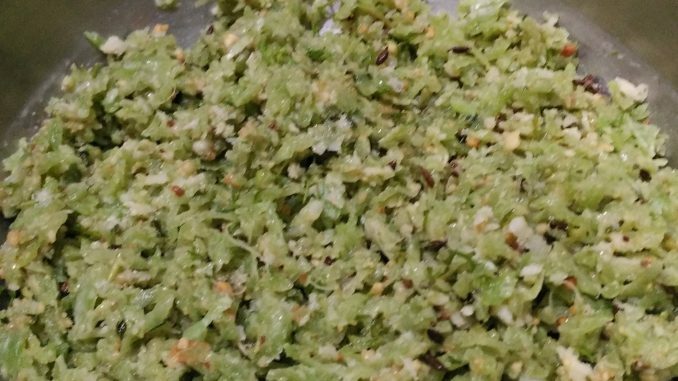 In Maharashtrians, Khanang Kakdi (Kakdi koshimbir – Cucumber Salad with roasted peanut powder) is very popular. 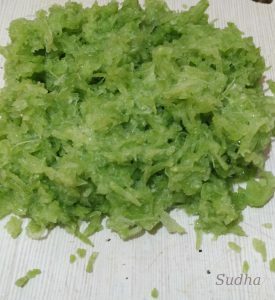 This Padwal (Snake Gourd) Koshimbir is made using the ingredients used for Khamang Kakdi. Generally many people don’t like Padwal. But if you make this Koshimbir, many will eat Padwal by choice. 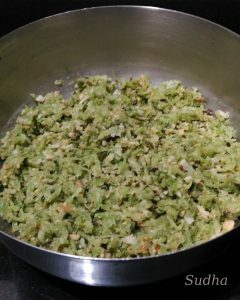 1.Wash and de-seed Padwal and grate it fine. Do not remove the peel. Drain water from the grated padwal. Don’t throw away the water. 2. Mix grated Padwal with Crushed green chillies, roasted peanut powder, salt, sugar, scraped coconut, chopped coriander and lemon juice. 3. For Tempering, heat pure ghee in a ladle on medium flame. 4. Add Cumin Seeds, wait till sputtering stops. 6. Pour this tempering over the Padwal mixture. Serve as a side dish. It goes well with Roti, Paratha or Curd Rice. The water you collected after draining grated padwal is very nutritious. Just add blank salt and sugar to it and drink it as appetizer. It’s tasty.